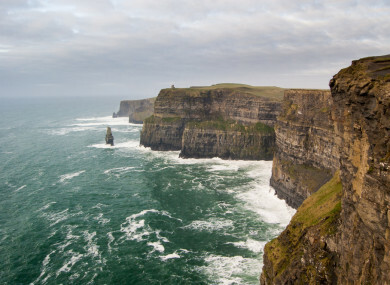 A GERMAN TOURIST has been airlifted to hospital after suffering a fall on a walking trail at the Cliffs of Moher in Co Clare. The woman, aged in her 50s, is understood to have sustained leg injuries on the trail close to Hag’s Head. Emergency services were alerted at around 12.30pm and a multi-agency effort was mounted to locate and recover the woman. An ambulance team and gardaí responded to the incident, which occurred close to Moher Tower at the southern tip of the Cliffs of Moher. The Doolin unit of the Irish Coast Guard was also requested to assist and sent volunteers to the scene. The woman was located on the popular coastal trail, some distance from the road and inaccessible by land vehicles. National Ambulance Service paramedics made their way to the scene on foot and assessed the treated the woman. In the meantime, the Emergency Aeromedical Service air ambulance, which had been on a training missing at the time, was diverted to the incident. The helicopter landed in a field close to the scene. Paramedics and Coast Guard personnel transported the injured woman from the trail to an ambulance. She was then transferred by road to the helicopter landing site and flown to University Hospital Galway for treatment. The flight to hospital took just 10 minutes while the same journey by road would have taken over an hour. Email “Woman airlifted to hospital after falling at Cliffs of Moher ”. Feedback on “Woman airlifted to hospital after falling at Cliffs of Moher ”.